It’s been a while since we’ve taken an in-depth look at one of Corsair’s keyboards, but the K95 RGB Platinum is a great reason to return. It is the luxury sedan of keyboards, dominating any desk it graces, both in sheer size and an impressive light-show that (for the moment) outshines all its competitors. Is it a bit gaudy? Sure. Everything about it is flashy, oversized, and slightly ridiculous. The craziest bit is that the K95 RGB Platinum is actually slimmed down from the K90/95 of old. Where once the K90 line sported 18 (yes, eighteen) macro keys on the left side of the keyboard, the new K95 RGB Platinum now has six. Whether it’s a cost-cutting measure, another sign that the era of macro keys is coming to a close, or just a straightforward change in design direction, there’s no disputing that it looks better. The old K90/95 had this weird trench between the backplates for the main keyboard and the macro keys, making it look like a K70 board that had been Frankensteined with 18 more keys—which for all I know, it was. The Strafe comparisons don’t stop there. While previous editions of the K70/K95 used a thin and clean sans-serif type on the keys, Corsair has been slowly moving all its keyboards to a blockier typeface. That process started with the Strafe, was folded into last year’s K70 Rapidfire, and now found its way to the K95. I’m not a huge fan, personally—I liked the semi-professional look of Corsair’s older K70, and that it blended with both home and office. The new K95 is decidedly more game-y. My guess is that Corsair changed the typeface to better show off its RGB lighting. In that respect, its an upgrade. With a greater translucent area on each keycap, the K95 RGB Platinum seems exponentially brighter than its predecessor, which is probably a good thing since you’re paying a premium for the lighting. The color is good, too—accurate, vibrant, and smooth. 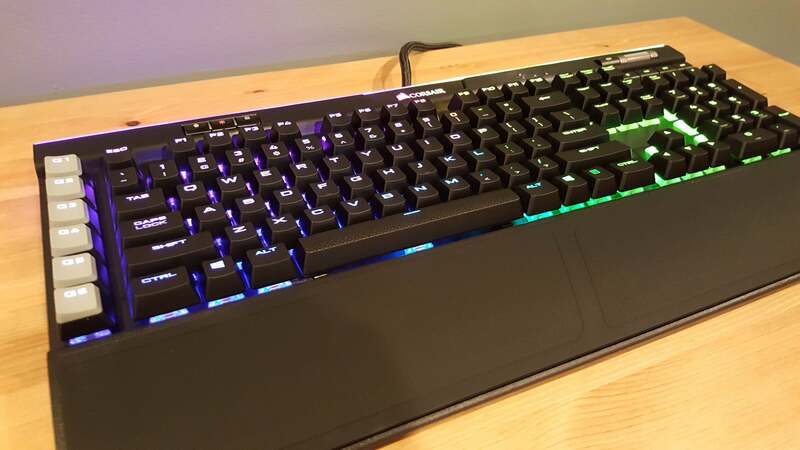 And with the K95 RGB Platinum, we have to be approaching “Peak RGB.” Not only are the keys backlit, Corsair has now put a multi-zone RGB strip across the top of the keyboard and underneath the logo. It reminds me of Razer’s reissued Diamondback mouse—as sleek as it is tacky, with your opinion likely hinging on how much you want your computer to look like Tron. 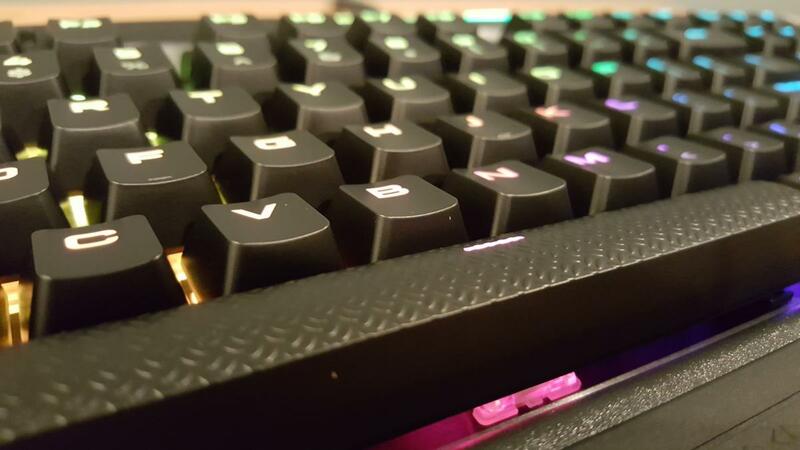 Assuming that is your intention, then the K95 RGB Platinum is the new high bar for keyboard illumination. Expect Logitech, Razer, and the usual suspects to follow suit shortly. The rest of the changes are smaller. The media keys have been reworked with a much more pronounced dome, similar to what I saw on Cougar’s Attack X3. The volume roller seems slightly smoother, though that might be imagined. The game mode and brightness keys have been moved to the left edge of the board, and the old K90’s three profile switchers condensed into a single cycling profile key. 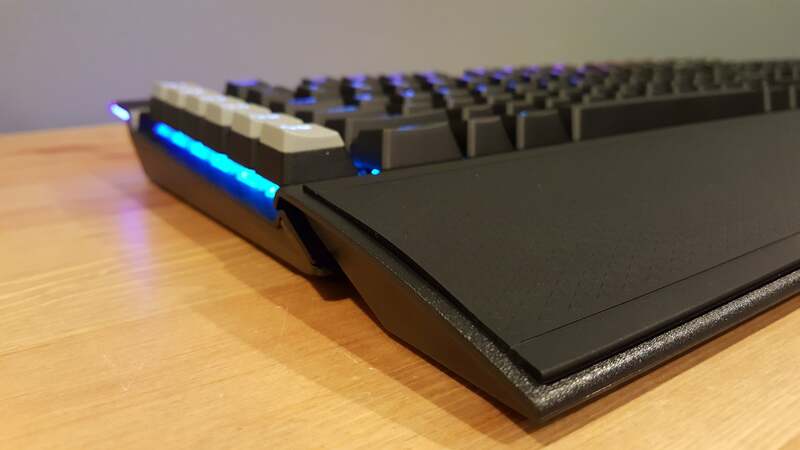 Corsair also redid the wrist rest. There’s now a double-sided rubber insert, one side textured and the other smooth, which slots into a plastic frame. It’s not a major feature, and likely useless to anyone who owns a separate wrist rest, but I appreciated the small luxury. It’s worth noting that Corsair’s still one of the only companies to use RGB switches from fan-favorite Cherry. Razer, Logitech, SteelSeries—most of the other major peripheral manufacturers—use proprietary switches, at least for their RGB models. G.Skill’s Ripjaws KM780 is the only mainstream keyboard I’ve seen use Cherry RGB switches aside from Corsair. In other words: Your choices are pretty limited, if you want both RGB lighting and Cherry’s reputation for quality switches. Chalk one up for Corsair, there. Not that there aren’t drawbacks. While Logitech’s Romer-G switches, for instance, house the LED in the center of the key and build the switch around it, Cherry’s “stem” design means the LED is embedded above the key. 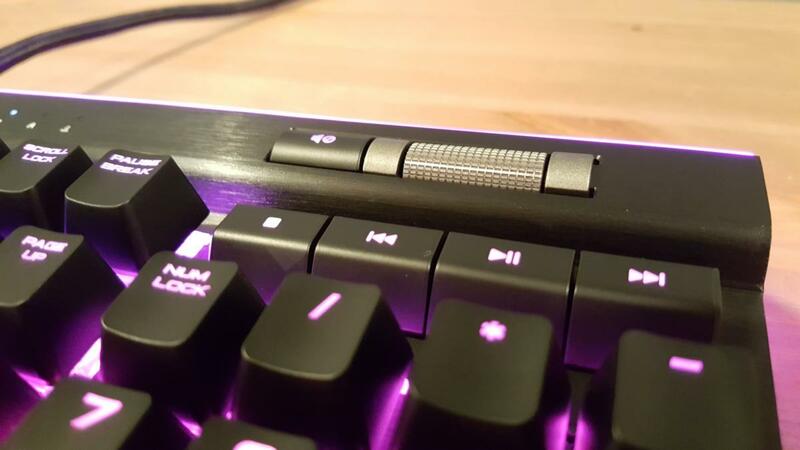 This is why the lettering on the K95 RGB Platinum (as well as Razer’s Cherry-type switches) is offset towards the top of each key. Corsair takes this one step further, surrounding the LED with translucent plastic all around. It’s bright and colorful, but also means you get quite a bit of light leakage on the keyboard’s facing edge. 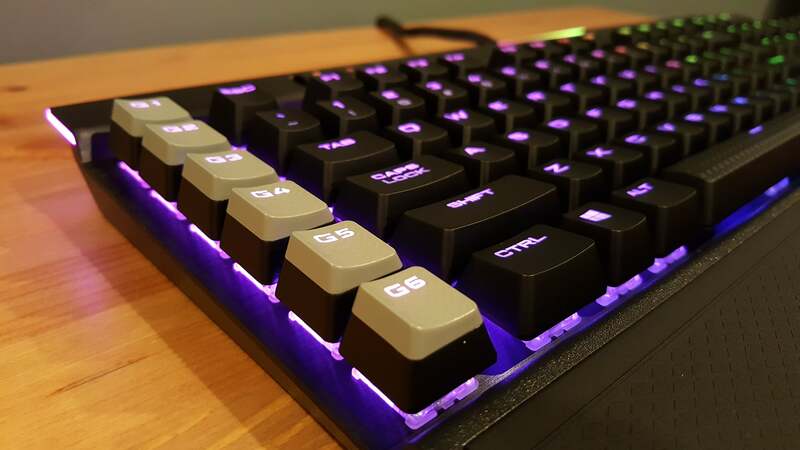 The K95 RGB Platinum is also interesting in that it’s only offered in a few configurations: the traditional tactile bump of the Cherry MX Brown or the ultra-light Cherry MX Speed (also known as Silver). The latter requires the same feathery 45cN of force as MX Reds, but with a shorter actuation point of 1.2mm. In practice, MX Speeds feel...pretty much like Reds. We’re talking about a change in actuation of a single millimeter, more or less. And it’s a linear switch, which means it’s difficult to hit the actuation point without simply bottoming out the key anyway. They feel smooth and responsive though. If you like how lightweight MX Reds are, there’s no reason not to get Speeds/Silvers on the K95 RGB Platinum. Personally, I find the small speed boost isn’t worth the increase in errors, but I suspect I’d feel differently if I used the keyboard primarily for gaming instead of typing. The biggest problem with the K95 RGB Platinum is, I suspect, the price. This really is the luxury car of keyboards, coming in at a list price of $200 (although you can currently find it for $160 on Amazon). That tops the list, at least as far as gaming keyboards are concerned. You can find some niche enthusiast boards for more (the beloved Happy Hacking Professional2 goes for upwards of $220 typically), but $200 is really expensive. And in the case of the K95 RGB Platinum, it doesn’t seem incredibly deserved. Sure, the light ribbon across the top is a nice touch, the brushed aluminum backplate is as classy as ever, and the keyboard feels high-end. 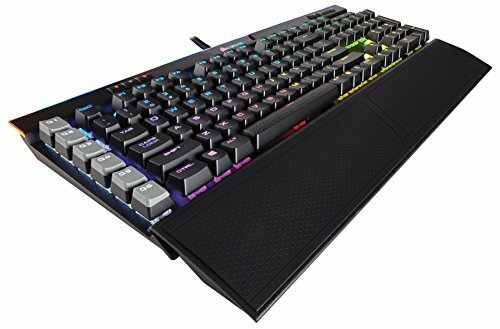 The fact remains, however, that you can find comparable boards for quite a bit cheaper, including G.Skill’s Cherry RGB-equipped Ripjaws KM780, a K70 knockoff which, despite some questionable aesthetic choices, also retails for a lot less ($140 on Amazon). That’s make-or-break territory for some people. 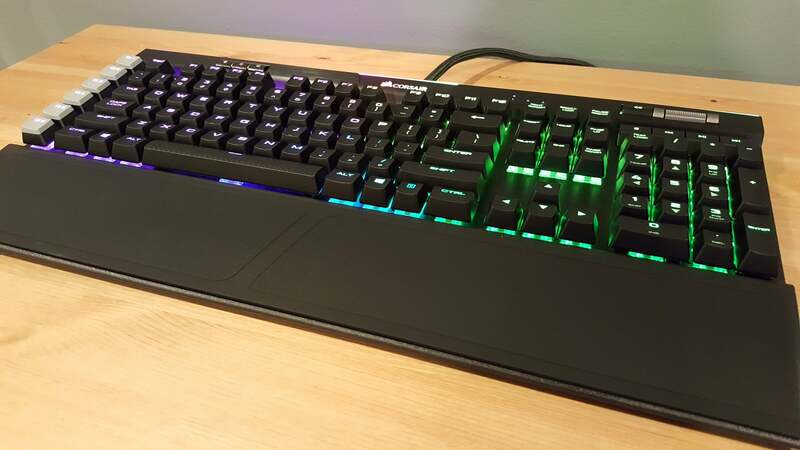 Regardless, the K95 RGB Platinum is a beautiful keyboard with excellent switches, top-tier lighting, and what I still consider the industry standard for media keys. Seriously: A volume roller is indispensable now that I’ve used one. So much more convenient than buttons. 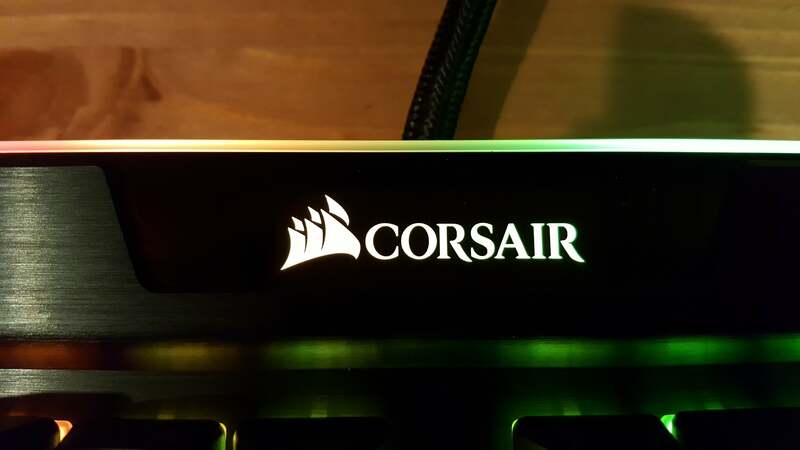 Add in the fact that Corsair’s software has improved immeasurably in the last few years, that the macro keys have been pared down to a more manageable six, and that the (never forget) logo is the familiar ol’ sails instead of the original K70/K95’s ugly tribal tattoo? The K95 RGB Platinum is one of the best gaming keyboards currently on the market. Not everyone needs (or can afford) a luxury car, though. If you’re looking at the K95 RGB Platinum and feel the price sticking in your throat, know that there are other options. The K95 RGB Platinum is a beautiful keyboard with excellent switches, top-tier lighting, and one of the biggest footprints you'll ever find. And it's still smaller than the old K90!